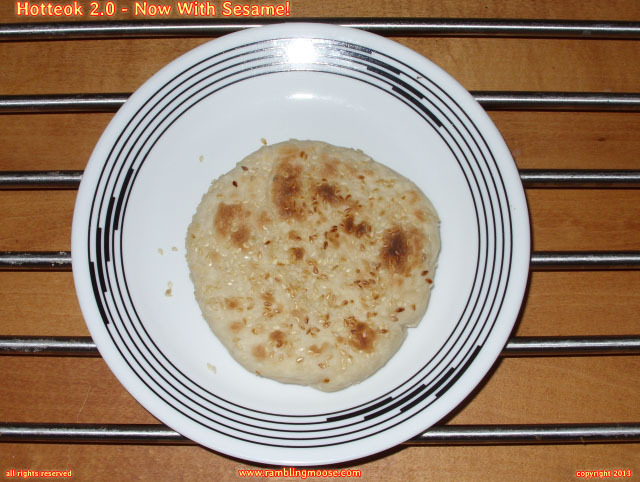 Rambling Moose: Hotteok 2.0 - Now With Sesame! As entertaining as I find cooking, I try not to do this sort of thing too often. It's way too easy to blow off an afternoon making goodies for yourself and others and end up being big enough that you are a center of gravity. It would get embarrassing if NASA called and said, stop you're making the satellites orbit strangely, wouldn't it? But, I did have to bake this weekend. I had finished off the last of the rolls in the freezer. Off to the kitchen I went and made up a batch of Pat's Pizza Dough bread. That's my Go To recipe when I want a nice, firm, and tasty loaf of bread or rolls. When I pulled the dough out of the machine, I looked over at the collection of spices and flavorings and decided to get creative. Yeah! I love Hottoeoks! What Kind? I'm going to try something different. Just wait! Ok... Looking forward to it! Hotteoks (Ho-Ducks) are a dough ball flattened. Drop a little sweet or savory in the middle, fold it up like a dumpling, and drop it on the skillet. Press down with a spatula until it's nice and flat. Cook in a little fat until that side is toasted, flip and repeat. That's all. It takes about 5 minutes to cook. I did say I got creative. The last four dough balls out of the 10 that I made were going to be standard Cinnamon Sugar Hotteoks. I rolled them in Sesame Seeds and let them rest on the plate as I put a thin film of Sesame Oil on the non stick skillet. The house immediately filled with a Sesame perfume both nutty and earthy. The smell was strong enough that it drew the dog out of hiding and Oscar the Parrot started calling out to me. I guess they were hungry. One of my simple pleasures in life is that when I get a bag of Sesame Bagels, to munch on the leftover seeds in the bottom of the bag. It's not something that happens often, but when I do get them I do enjoy those seeds and the leftovers on the "rolling plate" didn't go to waste either. So snacking on Sesame Hotteoks was going to be a treat. They were just as good the second day, cold out of the refrigerator. Hotteoks, or Korean Donuts, simply don't last around this house. The Yeast Risen Dough was flavorful and gummy, the filling melted nicely and formed a gritty caramel for the second day, and went down as a prized snack. As a benefit I did have 6 rolls for this week in the freezer. They should run out just in time for next weekend. If I have the free time, there may be more Hotteok in our future.